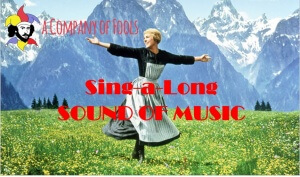 The Fools are alive with The Sound of Music! Is it holiday time again!?! We would be delighted to spend the winter break with you singing along to one of our favourite musicals. Please join us at The Mayfair Cinema on Saturday December 29th or Sunday December 30th for a family friendly sing-along Sound of Music! Doors at 11:30, screening starts at noon. Line up early to be sure to secure your preferred seat and grab snacks and drinks before the show starts. You bring the family and we will bring the lyrics. Costume prizes, 50/50 draw and a whole lot of fun! All funds go towards supporting our 2019 production of Torchlight Shakespeare (title to be announced in December)! What better way to get the family out of the house on a weekend afternoon during the winter break? This popular event sold out in record time last year. Act fast so as not to be disappointed! Tickets make a great gift – to someone else or even to yourself! Donations welcome. Fools Merch available. For info and details about wheelchair accessibility and accommodation features of The Mayfair Theatre, please call 613-730-6552. Please note that the Mayfair concession stand is cash only. An ATM is located inside the building. Please choose your dates carefully: We are unable to offer exchanges or refunds for this event. 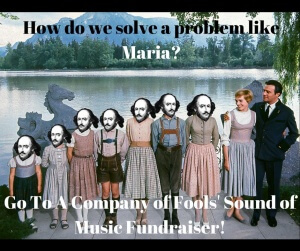 "a Company of Fools Theatre Inc."
Or click this button to donate online!